Superior cream for premium footwear: it comes in hard paste for the declared absence of water. The fine waxes contained in it, and the love with it is produced, allow to keep the skin of the shoe in time in health and beauty. Notes: An old formula, produced by hand for almost a century, poured into the cans while hot and closed as soon as the ideal temperature has been reached. The craftsmanship of the workforce means that some differences in consistency or colour nuances may occur. Metal box with the typical "butterfly" opening, which allows, instead of the pressure boxes, to keep sealed and complete the contents. This product is also available in black and neutral. Clean the shoe delicately with a cloth. 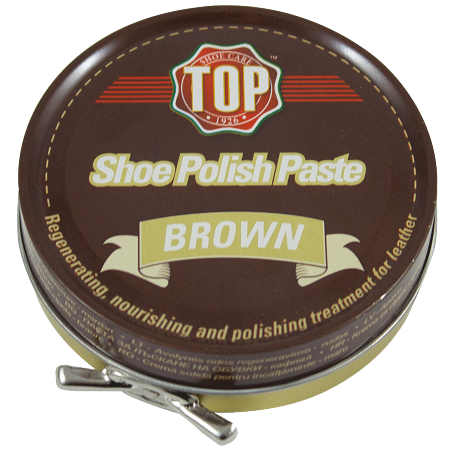 Put a small quantity of "leather regenerating treatment" on the brush and apply it evenly all over the shoe. Leave to rest to allow the natural waxes to penetrate into the leather to nourish it in depth, renovate the cells and rehydrate it. Take a woollen cloth and pass it repeatedly on the shoe to remove excess product and provide it will a mirror polish. Repeat the treatment several times a week in order to keep your shoes nourished, protected and polished, like new! The total absence of water from the formula in the can means that it is the most nourishing product in the entire Cosmetic Line for Footwear. The precious waxes contained in it are carried deep down into the leather by solvents and mineral turpentines which evaporate immediately afterwards, leaving the leather soft and regenerated. Polish the shoe with a woollen cloth to obtain a mirror shine.